Gingerbread Whisky Cake with Brown Sugar Swiss Meringue Buttercream and Milk Chocolate Ganache. It sounds like a mouthful, and make no mistake - it is. It’s cake that demonstrates my adoration for the flavours of the season. A cake inspired by the new fragrance from the Christmas collection at dusk - Gingerbread. It wholeheartedly embodies everything I need this season to be and more. Warmth. Heat. Sweetness. Spice. Exuberance. Drunkenness. Laughter. With each feeling embodied in a single, dulcet, slice of cake. I’ve always demanded heat and intensity, in all aspects of life. And it’s within the flavours of this cake, that I’ve harnessed it. 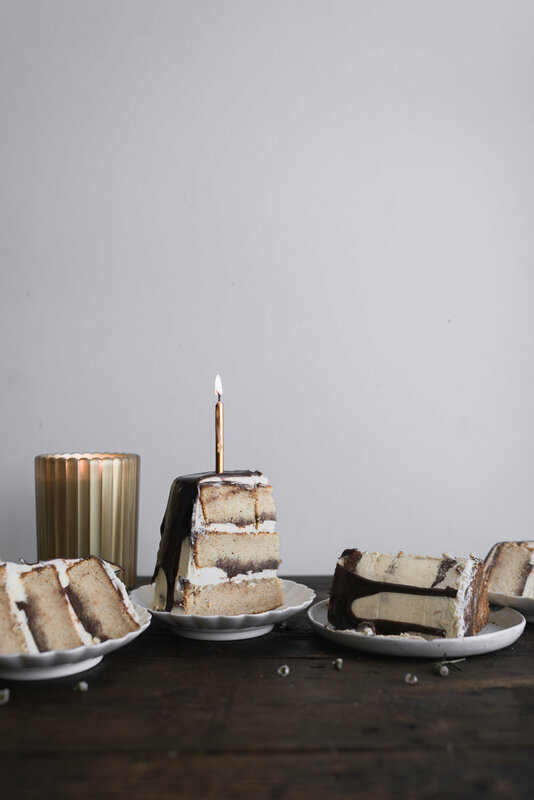 The cake is comprised of three heavily spiced gingerbread layers, inspired by the fragrant notes found within dusk’s Gingerbreadcandle. There’s a whisky sugar syrup to moisten each layer, that brings an additional element of indulgence and depth. And a smooth milk chocolate ganache between each layer, which is slightly salted, oh-so-sweet and soft. I’ve always felt that ganache makes everything better. And the presence of it within this cake is a testament to that. A brown sugar Swiss meringue buttercream fills and coats the entirety of the cake, which, unites all the richness going on within. It’s a cake of pure decadence, sweetness and spice. A cake for times of celebration. For laughter and loved ones. And there’s no other way in which I’d have it. If there’s anything I’ll be doing this season, it’ll be lighting candles and eating cake. Gingerbread candle and gingerbread cake - it’s a sensory affair. The two are fated for each other. 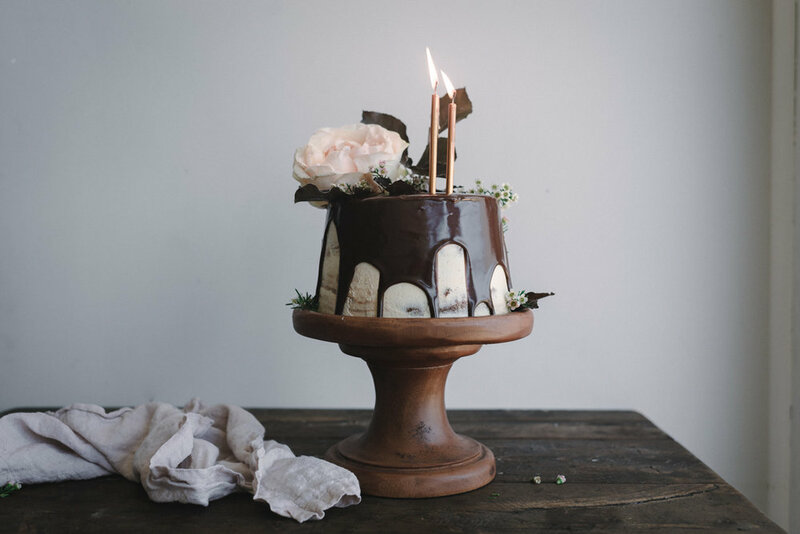 The cake is good without the candle, and the candle is good without the cake - but paired together? It’s heavenly decadence. There’s nothing that comes close to it. It’s the entirety of the season wrapped up in both fragrance, and taste. So, eat a thick slice of cake, light a candle. And feel completeness. This cake uses the reverse creaming method. Which utilises the technique of incorporating the butter into the dry ingredients at the beginning, instead of creaming together the butter and sugar. The result is a cake that is kept moist for longer, with a finer crumb and bakes up almost always flat. If you don’t like whisky, you could easily substitute it for another alcohol. A hazelnut liqueur, or rum, would be ideal. As too would espresso liqueur. Make sure that the milk chocolate ganache is completely at room temperature before using it to fill the cake. If the ganache is too hot, it has potential to melt the buttercream below. Additionally, make sure that when layering the cake, the buttercream dam is deep enough for the ganache to fill. You want the ganache to be contained within, not leak out the sides of the cake. Make sure that all the ingredients for the Swiss meringue buttercream are kept at consistent room temperature. You want the butter to be just soft and malleable, not very soft and runny. If you have a candy thermometer, you can test for the ideal temperature for the butter to be used, which is around 18 c (65 f). In the bowl of a stand mixer, whisk together the sugar, cake flour, hazelnut meal, baking powder, ginger, cinnamon, nutmeg, cardamom, all-spice, clove and salt. Set the mixer speed to medium. Add in the butter, a tablespoon at a time, until it is all used up. Beat, for a further 3 to 5 minutes, or until combined. The mixture should have formed a rough and sandy meal-like texture. In a separate large pouring jug or mixing bowl, whisk together the egg whites, milk and vanilla bean extract, until just combined. Set the mixer speed to medium-low. Pour in half the liquid ingredients. Beat until just combined then pour in the remaining half. Pause mixing to scrape down the bottom and sides of the bowl as needed. Increase the mixer speed to medium-high and beat until light and fluffy, 3 more minutes. Divide the batter between the prepared cake pans, making sure to use a rubber spatula to smooth out the top. Bake, for 25 to 35 minutes, or until risen, lightly brown and a skewer inserted into the middle comes out clean. Remove the cakes from the oven and let them cool in their pans for 15 minutes before carefully turning out and onto a wire rack to cool completely. Once cool, level off any domed tops. Combine the sugar, whisky and water in a medium sized saucepan set over medium heat. Heat, stirring often, until the sugar is dissolved. Bring the mixture to a light rolling boil, then, remove it from the heat and set aside to cool until needed. Place the finely chopped milk chocolate into a medium sized mixing bowl. Set aside. Set the cream into a medium sized saucepan set over medium heat. Heat, stirring occasionally, until the cream reaches a light rolling boil. Immediately remove the boiling cream from the heat and pour it over the milk chocolate. Let the mixture stand for 1 minute to acclimatize, then use a rubber spatula to stir until smooth and shiny. Place the egg whites, granulated and light brown sugar into the bowl of a stand mixer. Whisk by hand to combine. Place the bowl over a saucepan of barely simmering water set on medium-low heat. Do not let the bottom of the bowl touch the water. Heat, whisking often, until the mixture reaches a temperature of 70 c (160 f) on a candy thermometer. The sugar should be completely dissolved and the mixture hot to the touch. Once at temperature, remove the bowl from the heat and set it on the base of a stand mixer fitted with the whisk attachment. Add in the butter, a tablespoon at a time, until it is all incorporated. Add in the vanilla bean extract, cinnamon, clove and salt. Increase the mixer speed to high and continue to beat until the buttercream is thick and silky smooth and velvety, 5 more minutes. Set the buttercream aside for assembly. To assemble the cake, place the first cake layer, cut side facing up, onto a serving plate or cake stand. Use a pastry brush to glaze the first layer of cake with a little of the whisky sugar syrup. Then, use an offset spatula to spread about 3 generous tablespoons of the buttercream over the top of the cake. Slightly hollow out the center of the buttercream with the back of a metal spoon to form a buttercream dam. Fill the center with a quarter of the milk chocolate ganache. Gently press on the second cake layer, cut side facing down. Repeat the layering process above. Gently press on the final cake layer, again, cut side facing down. Cover the top and sides of the cake with a thin layer of the remaining buttercream. Set the cake in the refrigerator to chill the crumb coat, about 30 minutes. Once set, remove the cake from the refrigerator and use the offset spatula to spread on a final layer of buttercream. (You can choose to frost the cake either thinly or thickly, here. I kept the final buttercream coating thin – for a more naked cake effect). Set the cake back in the refrigerator to chill for a further 30 minutes to firm the outside buttercream. Once firm, remove the cake from the refrigerator and pour the remaining half of the milk chocolate ganache over the top of the cake. Use a butter knife or offset spatula to help it spread down the sides of the cake to form a drippy effect. Again, set the cake back in the refrigerator to chill the chocolate, before serving. Thank you to my friends at dusk for sponsoring this post. As always, all opinions and words are my own. You can follow dusk on social media hereand here. Find out more about their Christmas collection,here. Andhere and here to see other cakes I’ve created for dusk in the past.